If we decide to enter into a lead generation activity with your business then by definition we take the marketing risk - thre's no marketing risk for you. We turn risky fixed costs into manageable variable costs. 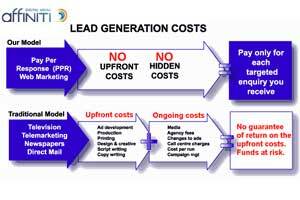 That's the advantage of our "Leads Machine" lead generation service. Imagine the cost of setting up your own online marketing activity - you've got to build a focused website and then find economic ways of driving traffic to it. That's a big upfront expense and a big cash risk. And if you're not familiar with the online world then you haven't got the learning curve benefits either. That's where we can help you. We have been through the learning curve - we know the relative merits of the different forms of online marketing and we can quickly identify where your target customers or consumers are likely to be. So, let us take the risk for you. We need to understand your market in depth to ensure that our lead generation programme is appropriate. Then we can give you an estimate of the probable lead price. In some circumstances we may judge that it would not be feasible to work in your market space, but this is rare. Once the lead generation campaign is running you only pay for each lead as it is delivered to you - hence "pay for performance". There are no fixed fees, so if we don't deliver then you don't pay. Because we have assessed your market prior to entering into an agreement we have every confidence that we would be able to provide the volume of leads you need at the quality that you need.. If this "Leads Machine" service sounds interesting to you then the first thing to do is contact us and tell us more about what you need. Then we'll be in a position to assess the merits of working in your market.